Prescription pain medication does help ease pain, but it has a list of unwanted side effects. If you're looking for a way to get relief from leg pain without any medication, the Eastern medicine technique called acupressure, could be an option. Using specific pressure points, you can apply pressure to relieve pain and other symptoms, but you'll only see success if you know how to find the right points. Turn your hand facing palm down, and find the spot where the joint of your index finger and thumb come together. You should be able to feel a depression in that area, and that is a pressure point designed to relieve leg pain. This point also treats frontal headaches and cold symptoms like sneezing and a runny nose. Slide your four fingers together up your shin towards your knee, and stop when your hand hits your knee. The next pressure point is right underneath your pinky finger. Apply pressure where it is most tender. You may or may not feel a depression at this point. This not only treats leg pain, but also anxiety, depression and low immunity. Massage one or both points for three to five minutes, or however long it takes to feel relief. For the best results, use the tip of your finger, your knuckle or the eraser end of a pencil. 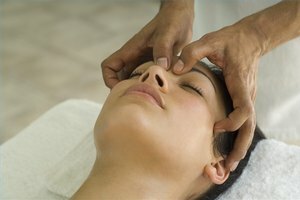 Acupressure is not designed to replace standard medical procedures and treatments. If you are seriously injured, or if your symptoms persist, seek medical attention. You also should not use acupressure if you have a heart condition, if you are pregnant or if the point is under a mole, varicose vein, bruise or any other break in the skin. You also should not use acupressure within 20 minutes of bathing, eating a large meal or exercising.